The charcoal bath bomb created extremely dark water. Some of charcoal immediately clung to the side of the bowl. It also clumped up in the water in interesting ways, and transferred to the skin in clumps. 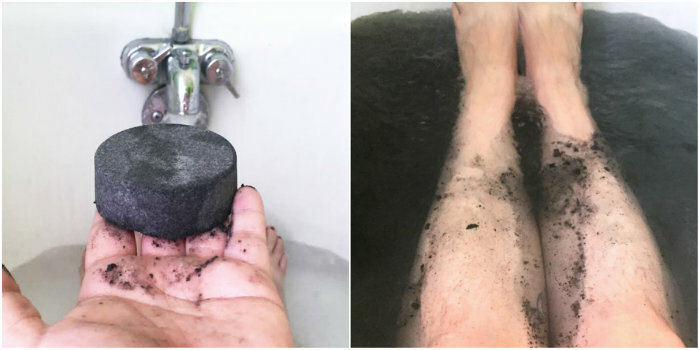 The liquid black bath bomb created a gray-ish color in the water. The colorant did tend to stick to the sides of the bowl, but not nearly as much as the charcoal bath bomb. The colorant did not stick to the skin either. Tina in customer service (meet her here!) was brave enough to test the fizzies in her tub. 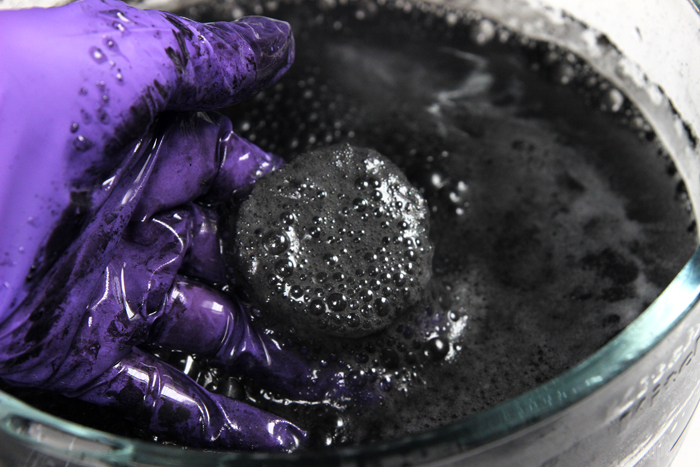 Ultimately, the bath bomb made with activated charcoal colored the water a dramatic black hue. But, it bunched up in the water in rather unattractive clumps. It also left a real mess in the tub. 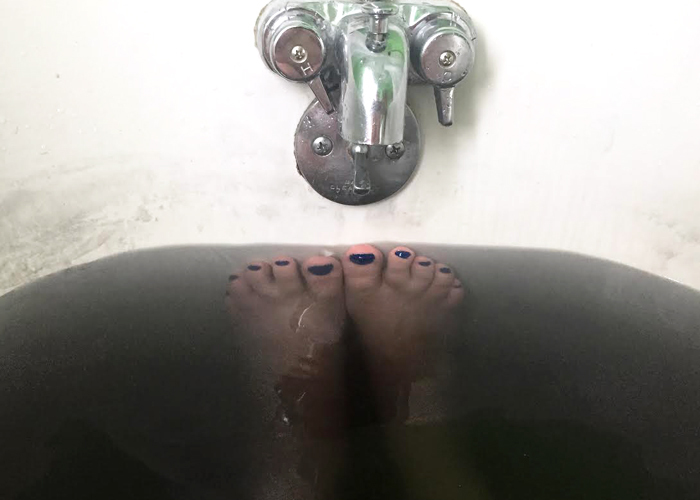 The bath bomb made with Liquid Black Iron Oxide turned the water a gray color, but left less of a mess on the tub once drained. After the bath, Tina needed a shower to rinse off all the charcoal and Liquid Black Iron Oxide that stuck to her skin. She found the best way to clean up her tub was with plenty of dish soap. With a little scrubbing, the colorants came off of her porcelain tub without permanent staining. 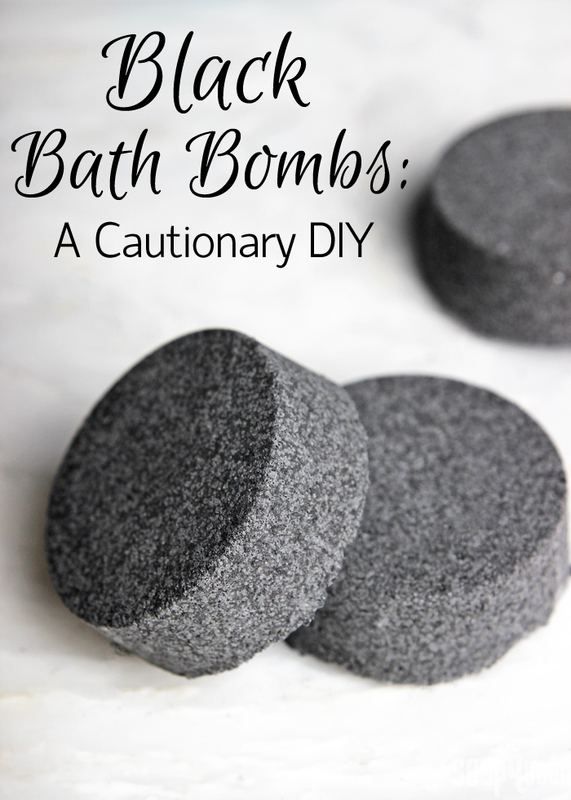 After a several readers suggested adding polysorbate 80 to the bath bombs, we gave it a try! Polysorbate 80 is normally used as a co-emulsifier, and helps emulsify oils in bath water. Interestingly, it can also prolong the fizzy reaction in bath bombs. 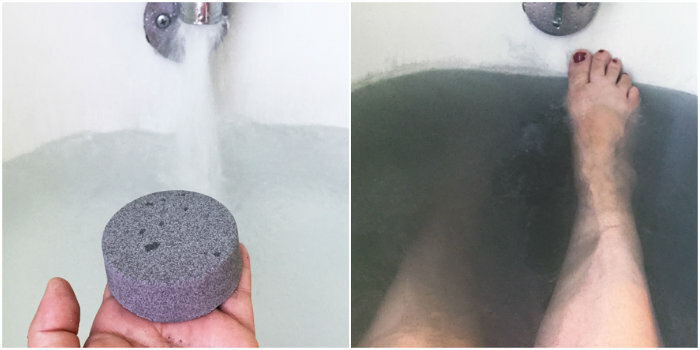 Because the activated charcoal gave the darkest color in the tub, we tested using Polysorbate 80 in the activated charcoal bath bombs. Technically, polysorbate 80 can be added to bath bombs as a wetting agent at a usage rate of 1-6%. In our tests, we found that more than 2% can cause the fizzy to expand. Four our test, we used 1 tablespoon of activated charcoal into 10 oz. of bath bomb mixture (2 parts baking soda + 1 part citric acid). Once the dry ingredients were mixed, we added 1% polysorbate 80, and a few spritzes of witch hazel to achieve a “wet sand” texture. Then, we let the fizzy dry for 24 hours before using. Once it was fully dry, we tested it in a large bowl of water before trying it at home. 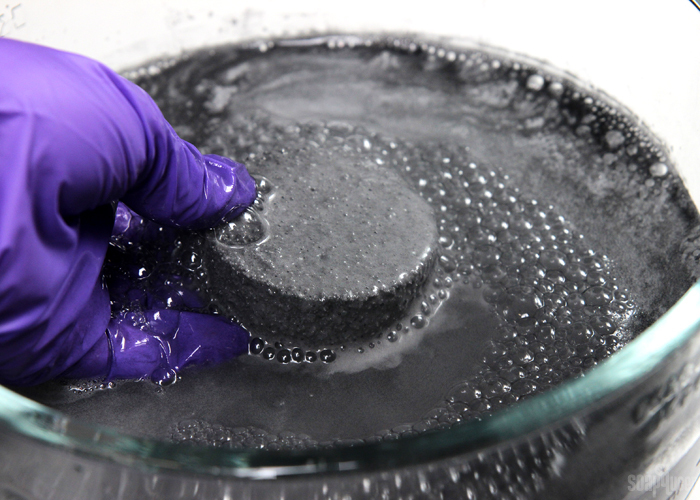 As you can see in the photo below, the polysorbate 80 helped the activated charcoal to evenly disperse in the water, without large chunks. Tina took a fizzy home to test in her tub. Once added to a large amount of water, the fizzy created a slightly grey tone, rather than the rich black color shown above. But, it gave a similar effect to the dark colors that some have achieved with gel food coloring. 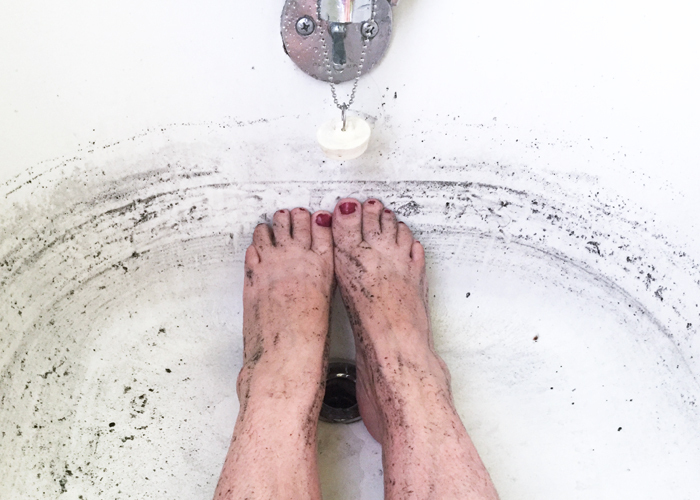 Tina reported that some of the charcoal stuck to the sides of the tub, but it wasn’t nearly as messy as the activated charcoal bath bomb without polysorbate 80! Most of the charcoal dispersed in the water and went down the drain, rather than clinging to the skin and tub. I have made several batches of bath bombs using micas and liquid colors with polysorbate 80. With the micas, I still get a ring around the tub. Also, every time I combine the coconut oil and poly mixture with a liquid colorant with or without a binder, the mixture becomes gel-like. The end result being that some of the gel residue sits on top of the water in the tub. Is this suppose to happen? Is there such a thing as a bad batch of polysorbate, or am I just mixing these incorrectly? Yes, it’s still normal to get a ring around the tub with micas and polysorbate, especially if your recipe contains oil. Polysorbate helps, but it doesn’t eliminate the ring completely. You may try using less oil in your recipe – that can often help as the colorant tends to cling to it. When we mix together oils and polysorbate, they do turn into a cloudy mixture. How much of each are you using? I was previously told (from outside source) to use about half the amount of oils for polysorbate. I have tried weighing; 10mls of coconut oil, and 5mls of poly. Also tried 2 tbsp of coconut oil, 1 tbsp of poly. I have tried decreasing the poly, and I get the same result. Aside from using small amounts of binder (water, witch hazel, or alcohol 70%), these are the only liquids I use. When I combine the binder with the oil mixture, the mixture becomes gel and no longer a liquid. There is not a strict rule for how much polysorbate to use, which can make it a little tricky. In general, you will find that a lot of our recipes call for about half of the weight of oils for polysorbate as well. For example, if there is 1 oz. of oil, we use about 0.5 oz. of polysorbate. If we are using a lot of mica, or a heavier oil/butter, we may increase the amount of polysorbate. Polysorbate is quite thick, so when it’s added to oil, it does tend to thicken the mixture and give it a cloudy appearance. The more polysorbate is added, the thicker it will become. Coconut oil is also a “heavier” oil than some (fractionated coconut oil, avocado oil, sweet almond oil, etc. ), so adding polysorbate to room temperature coconut oil can create quite a thick mixture. Adding it to lighter oils does not create a mixture that’s as thick. If you add the same amount of oil and polysorbate by weight into a jar, mix them together, and then introduce water, you may find it forms a gel – it’s quite interesting! You may try experimenting with a lighter oil that is not solid at room temperature in your formulations. The amount of mica, polysorbate, and the amount/type of oil in your recipe is a balancing act. If you have a lot of mica in your recipe, a lot of oil, or a heavier butter, more polysorbate can help. But, it can only do so much. If you like oil in your recipes, consider using less mica. Some prefer to not use any oil at all to help with the ring. Another thing we have found in our tests, is that giving our tub a wash before using a bath bomb really helps. The mica and oil tends to cling to residue on the tub. If all else fails, you may prefer using our La Bomb Colorants. They are dispersed in glycerin, and are specially formulated to not leave a ring around the tub. I am looking for less toxic version of Polysorbate 80. Even though it’s supposedly “safe” and FDA approved I don’t feel good about it. I still feel like the toxicity levels are too high especially considering that the bath is supposed to be healing and me and those using it are using it to heal not add even microtraces of toxic stuff. Did you try other alternatives? I am thinking maybe lecithin? Not sure if that would work but any ideas would be appreciated. I am not making bath bombs just activated charcoal bath salts. Thank you. We haven’t found an alternative to polysorbate 80 that works as well. You can leave it out of your bath bombs though. You’ll want to keep a towel nearby to wipe off any transfer and use care when exiting the tub as it will be slippery. Read all the comments, and down below there is some discussion about LaBomb and Lab Colors, La Bomb being glycerine based and Lab Colors being water based………but Lab colors don’t come in black anyway so it’s not an option, unless you mix it yourself. Anyways, as I was reading I started to think about mixing methods and the whole water issue with water based colorants and bath bombs. How about this: Color your dry ingredients separately, before mixing them together, and spread them out to dry. As they’re drying, give them a little toss or turn and break up any clumps that are forming with your fingers. Then give them a good sieve into your mixing bowl. I’ve only made bath bombs once or twice, but I will color individual dry ingredients seperately often if I feel that extra moisture will cause a problem. Once you add water to the baking soda and citric acid, the mixture starts to react. As the powders sit out to dry, they will continue to react or start to harden, meaning it will be tricky to mold them. We recommend instead to use powder or La Bomb Colorants. Once any liquid is introduced, get those bath bombs molded as quickly as possible so they hold their shape in the mold. This popped into my head to try today. I make all of my bath products with micas, because I am allergic to a lot of dyes. I googled “activated charcoal polysorbate 80” and of course Soap Queen had the answer and had already done the preliminary experimentation. I am very happy and looking forward to a fun new product! Thx. 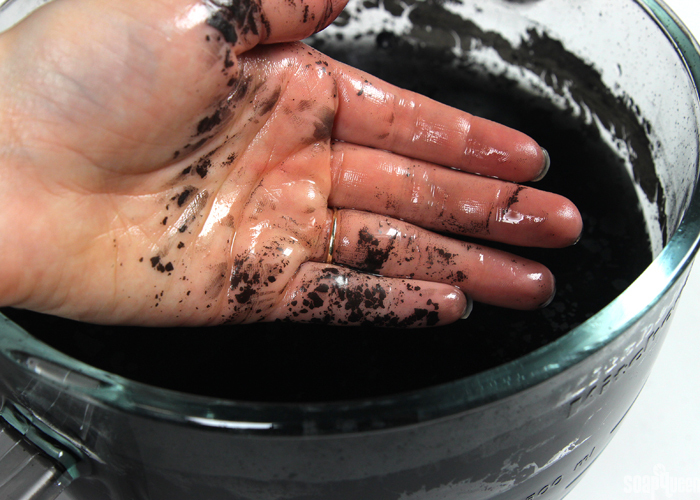 Has anyone found success in using activated charcoal in a full body scrub? If so, what have you used for clean up? Any natural cleaning options? Any help is greatly appreciated. Hi, when you say 1% poly, it is 1% of what? Is it total weight of everything combined? That is correct, the 1% is 1% of the total weight of the recipe. We usually add .1 oz. of polysorbate 80 per cup of fizzy mixture to help mix the color with the bath water. Hi there!! 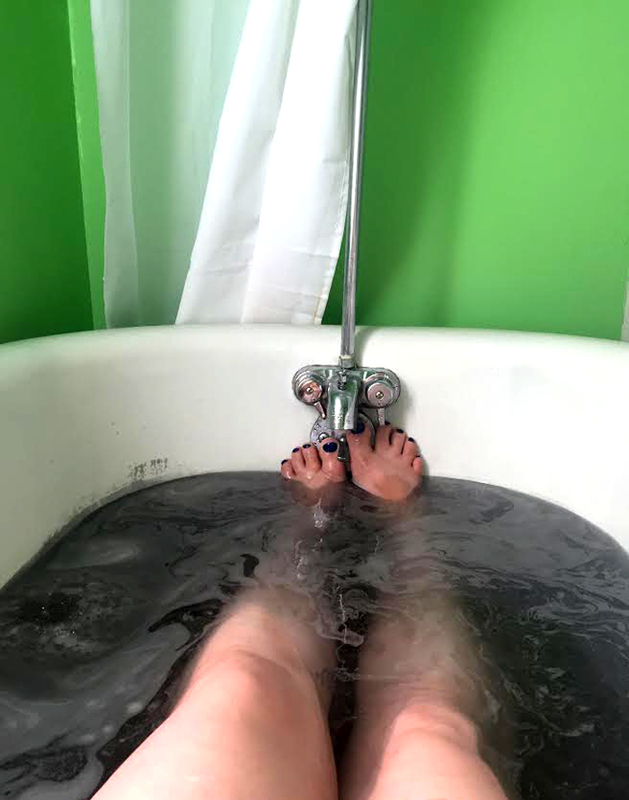 I have been making activated charcoal bath bombs, but recently they seem to be having two problems (they are made the same way every time, and the same as all of my other ‘flavors’ aside from the poly 80 and charcoal). Activated charcoal, poly 80, citric acid, baking soda, epsom, pink salt, coconut oil, essential oils, and rose water. Problem 1: They seem to only sometimes develop white spots everywhere, I can’t tell if this is the coconut oil or poly coming out? Problem 2: They want to stay a solid and VERY slowly disintegrate and barely fizz… again they are made the same way as my other ones with only those two ingredients changing. I’ve played with the amount of poly added and it seems to happen either way. White spots can sometimes be caused by chunks of baking soda or citric acid. It helps to break those up with your finger or run the powders through a sifter. It may also be that the bath bombs are attracting water, which could also be the reason for the lack of fizz. How are you packaging the bath bombs? If it’s humid in your area, the salt in the recipe can draw in moisture from the air. Hi Kelsey! It’s not coming from clumps, I always make sure to break them up completely. : ) These are spots that look like they are seeping out of the ‘pores’ of the bombs. They develop after more than a week. All of them are packaged in sealed shrink wrap as soon as they are hard. I also have a dehumidifier for them. Hmm, I’m not sure why those spots are appearing. Are the spots wet to the touch? 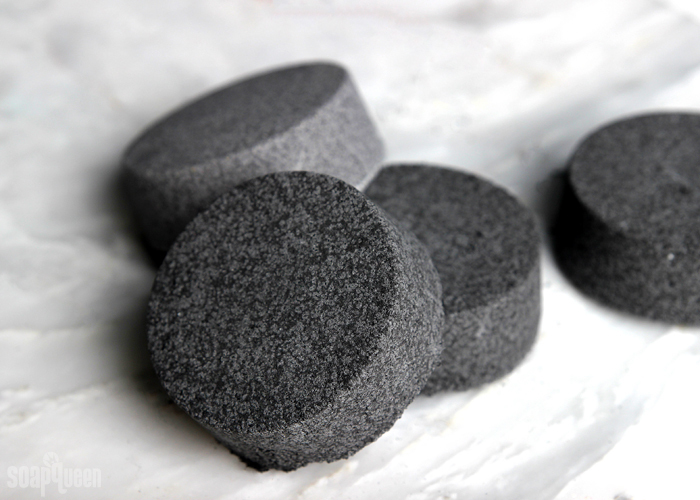 Activated charcoal is a natural product, so it can smell a bit earthy. However, we haven’t experienced that smell before. It may be the mixture of your essential oil and the witch hazel? What essential oils are you using? How do your bath bombs turn out? Mine always sink to the bottom and produce very little fizz. The ones that fizzed the most are the ones that I got a little too wet and they rose a lot in the muffin pan, but they still fizzed nothing like store bought ones. I get too much of a reaction with witch hazel so I started using 99% rubbing alcohol, it has almost no reaction and bath bombs dry faster because it evaporates so quickly. Has anyone tried making this with black clay? I’m thinking of trying it, but I’m kind of wary. I make black bath bombs with kaolin clay and it works well! 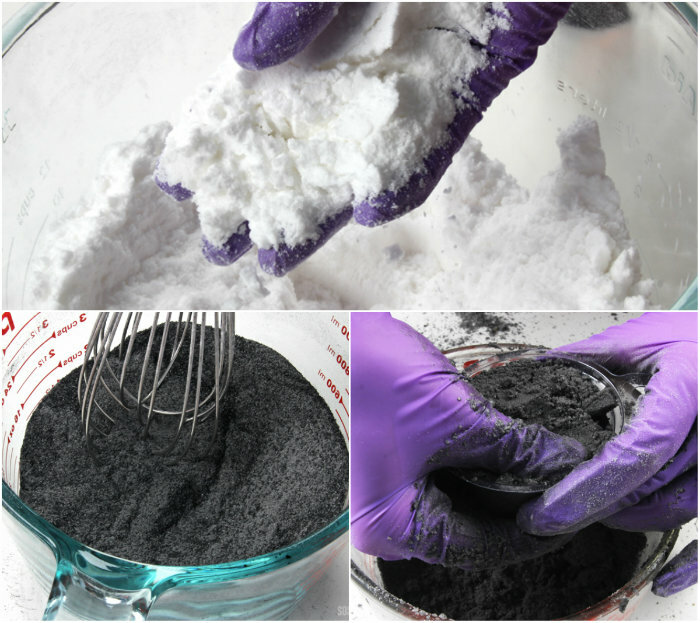 I use a mix of black oxide liquid, black mica, and charcoal and never skip the poly 80 and any additive I add to black bath bombs preform well. I have made these with Black Sea salt, powdered milks, and SLSA as well and they all do well. The only thing I haven’t tried is a black bath bomb heavy in butters. Any chance you could share the recipe? :-). How did you clean the charcoal from the sides of your tub after? I like magic erasers for cleaning, and having a freshly cleaned tub before using anything with a lot of color is a huge help. Can I use polysorbate 20 instead of 80? Is their a more natural alternative to the polysorbate 80, I love the detoxifying properties of activated charcoal and don’t mind the clean up, if it means my body is free and clear of all things hazardous to my health. For instance in cooking corn starch can be used to prevent clumping, do you think that might help without interfering with the other ingredients. Isn’t cornstarch in bath bombs a bad idea as it can cause yeast infections in those prone to them. I recently made a beautiful black bath bomb. I used FD&C dyes mixed in glycerin. I used red, blue and yellow at first. You will need more red and blue than yellow. I ended up using basic color knowledge and switched to purple. that did the trick. It came out beautiful, perfect black and didn’t leave a speck of black in tub. No Polysorbate 80 needed. Black gel food coloring works best for black bombs. The color doesn’t stick to the skin or tub. It looks deep forest green while it’s wet so don’t go crazy with the coloring. It will blacken more as it dries. My black bombs are true black in the tub. It’s like taking a bath in an ink well. How much of the gel do you use? Do you know the ratio of Blue, Yellow, Red? I couldn’t find the video on your youtube page. Ew Ew ewwwww! I personally want to gag when colors stick to my tub and body and am so grateful you tested this and not me! I must admit the bombs look really cool when solid though! 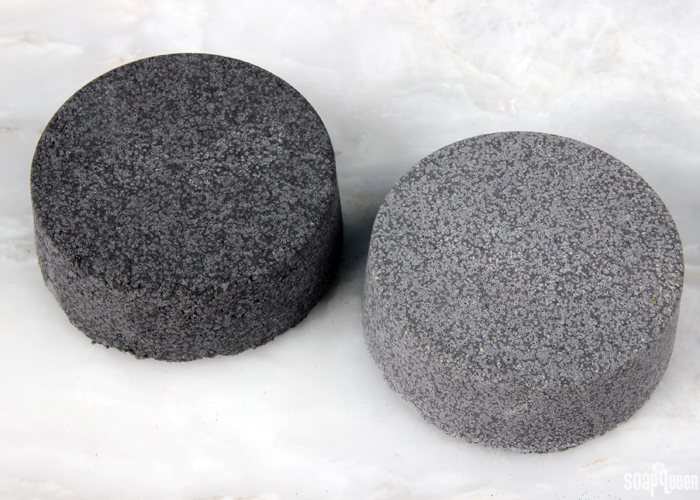 I have made black bath bombs using activated charcoal, mica and more poly 80 then I would normally use in my other bombs. Their will be a residue if you don’t wipe the tub prior to using the bath bombs, but if you start with a clean tub then the poly 80 seems to be pretty good. Seems to me that people wanting black bombs are kind of expecting to clean up after them. Don’t oxides create a sulfur smell in bath bombs? I had the same thought about the oxide as that’s what I’ve always heard as well. The PH is too low for an oxide…but i think that’s exactly the smell I’m experiencing from the charcoal. And yes, I agree if the tub has some oil residue from a past use the product tends to cling. Personally I haven’t had the smell with activated charcoal. I have a wholesale order for 500 so I hope I never do!!! That would be awful. I would love to know the colorant that the hex bomb uses. Her bombs are so black. With the poly I do get a ton of foam. My goodness, that must be a huge mixing bowl, haha!! I’d die if I had to make 500! Good luck! I viewed the website when they were just becoming a hot item and it listed “food coloring”. They have since removed the words, “food coloring”. I checked a while back and the Hex bomb used a black oxide for a while, but now it looks like they are using pigment/dye. Oxides don’t create a smell that I’ve noticed, but ultramarines sure do. So basically the blues and purples that I got in my oxide sampler from another vendor made my lavender bath bombs smell like fart bombs. I’d love to use activated charcoal for its benefits so I think without going to lakes or dyes I’ll have to stick with polysorbate 80 and a combo of micas or oxides and activated charcoal. I’ve made two batches of these with other colors mixed in. One with activated charcoal and some black powdered food coloring along with a dark green. The water was gorgeous I must say! The second was black with purple..this did not turn out pretty at all. When I add SLES or SLSA plus poly 80 the bombs foam out instead of fizz. The hex bomb is fizz all the way. I personally like the foaming bombs. NOW FOR MY PROBLEM, they stink, they stink..did I mention they stink? These are the ONLY batches I have made that have this awful odor so it has to be the charcoal. The label on the product states that it is Coconut Carbon Powder, Smooth. Any idea why they smell so bad? The last batch my daughter came into the kitchen and asked if the cat had an accident! Also any dark colored bath bomb I have made leaves a residue even with the addition of Poly 80. I don’t see this as being an issue. It’s not much really and if I splash the sides of the tub with a cup of water it rinses off for the most part. For one that is more stubborn I just use a bit of shampoo on a sponge and it comes off easily. Thank you for the reply. Yes, in both batches I added additional fragrance. Both times an incense type scent such as dragons blood but not the same fragrance twice. I’ve experimented with many oils but at this point I just use sunflower oil with scent and poly 80 added to the wet ingredients. SLSA is added to the dry ingedients. I don’t use any water or witch hazel/alcohol in the mix. I really don’t want to breakup enough capsules of charcoal from the drug store but may have to make sure the large container I bought from a reputable online vendor isn’t the culprit. Thanks so much for that recipe! To be honest I’m a bit stumped as to what’s causing that smell. Witch hazel can have a surprising scent if you’ve never smelled it, which is why I asked about that. If the oils are older – for sunflower oil that’s 3 months – they can go rancid. That causes sort of an oily/Playdough smell. How old is your sunflower oil? Thanks Victoria! You’re welcome Kelsey! I checked the oil and it’s fine..fairly new with an exp of 7/2017. One of these days I will try the capsules I have and get back to you. I truly think it’s something that might have been added to the charcoal which upsets me since I also use it for my soap. tried without fragrances, cornstarch or butter. bicarb, epsom, citric, kaolin clay and charcoal was my last experiment but as soon as any water is introduced it gets real farty! I see people using that exact recipe to good reviews! I’m going to keep experimenting but I’m already guessing that something is wrong with the charcoal somehow. did you buy yours from thesoapkitchen.co.uk too? I’ve actually made relatively nonstaining black bathbombs before, using mica and some poly 80 to help with the sticking issue. They didn’t turn the water pitch black but with some tweaking, I think I could manage something decent. Lindsay, how much mica are you using? I would think quite a a lot? The black I have added foams out to gray and it’s an interesting look but without another color the water is just a drab gray. Disperse the mica or colors inside the spray bottle of water or witchhazel. I do this when making regular bath bombs. Not black, I haven’t tried it with the black. Im thinking if I make my solution entirely in the bottle, or turn it into some sort of gel first… The idea would be to get it emulsifed BEFORE adding it to the bath bombs. Technique is as important as recipe as all bakers know… I been testing these like crazy. Im getting ready for a huge launch in October! Either way, I love spraying my bath bombs with colored water/hazel. Its easier to get my colors in that way & you can control the depth of it as well. I am so happy you guys did this blog. One less experiment I have to make! yay! That is a great tip Vanessa, I will definitely have to give that a try the next time I make bath bombs! This is such a coincidence! Today I had my friends daughter and her friend over for a bath bomb party! They begged me to make black! We used activated charcoal and black glitter. They came out beautiful! I haven’t tried it yet but I warned them it may turn their tub black! We will see!!!! I have used the HexBombs black bomb (the one in the linked video) and it didn’t have this problem; no clumping and neither I nor my tub were stained! I don’t mind herbs in my bombs but I really dislike bombs with glitter in them and other things hard to clean out of the tub. I was curious about replicating it myself, good to know these aren’t the way to go. Will you be continuing your experiments with black bombs to find out a way to make them? did you buy the Hexbomb in the US? Becuase those colorants they use are not approved in the US. so we are stuck trying to make within the law. I tried it with green and it’s not worth having to scrub tub after. Good to know Debbie! I agree, scrubbing the tub after taking a bath is a hassle. It’s definitely not my idea of a relaxing bath experience! Thanks for doing this. I’m one of the odd ones out…………..I don’t see anything appealing about it. For me, it would be like sitting in dirty water, lol! My bath bomb formula can take liquid dyes as the order of ingredients does not set off any reaction. Is the fizzy reaction for your LaBomb dyes the only concern with bath bombs or is there another reason they cannot be used? The LaBomb colorants are FD&C dyes dispersed in glycerin, which does not set off the fizzy reaction. Lab Colors are FD&C dyes dispersed in water. When Lab Colors are used in bath bombs, it will set off the fizzy reaction before it’s placed into the mold. They can still be used, but once they are added to the tub, much of the fizziness has already occurred and they aren’t as strong. I hope this helps! I wouldn’t really say this is 100% true. You just have to be careful with how much of a water based colour you use. I’ve been making personal use bathbombs with water based food colouring. If I add too much all at once, or add too much in general, they do fizz, but adding in a bit extra of a dry ingredient (typically I toss in a little extra milk powder) it stops the fizzing once it’s mixed in and the wet/dry ratio is restored. I was very curious about this so I’m glad you made this post. The last thing I want to do after taking a relaxing bath is clean the tub! Like other people mentioned, I would love to see results using Poly 80. Thanks! I’m glad you enjoyed the post. We’re happy we saved our readers a few hours of scrubbing their tubs! :D. We are hoping to test the Polysorbate 80 today, or next week! Do you think that the luster black mica would react like the activated charcoal? Or would it have a better effect? This is just not something I find particularly appealing. I did talk this over with my 14 year old grandson and promised to make him one IF: He would tell his mom he needed to get baptisted again and IF: he would hide the bath bomb under his shirt while doing so. He blushed extremely red and laughingly declined. I have not yet had a taker on the offer so no bath bath bombs for me. And yes, my pastor would most likely kill me after he recovered from the stroke and found out who was behind the “Momentous Baptism”. I haven’t laughed that hard in a long time! My minister would go into shock first and then keel over dead!! Right after he asked someone to rededicate the sanctuary! Thanks!! Oh, Vonda! I love it! I saw a video and someone had success with using gel black colorant, polysorbate 80 as well as the activated charcoal. I’ve been trying to replicate the amazing colour effects seen in bath bombs as of late (I.e LUSH) and I just can’t seem to match it either. I haven’t had any experience with Polysorbate 80 and am quite new to making fizzies. How would I go about using this and what effect would it have? Also I know you will suggest Labomb but what type of colourants is this? I’m finding it difficult here in the UK finding an appropriate colourant that won’t fizz up my mixture. Many Thanks for any suggestions or help you guys can provide. In general, we recommend using La Bomb Colorants, which are FD&C dyes dispersed in glycerin. They give the fizzy color without leaving any color on the tub, or clumps of color in the water. They are easy to disperse, and the glycerin does not set off the fizzying reaction. But the La Bombs are not available in black, so we tried some other colorants :). I’ve included a link below to the La Bombs if you’d like to check them out. Polysorbate 80 can be added to bath fizzies to help any oils in the fizzy disperse better in the water. Some find it helps them fizz longer as well! For color, you can also use powdered micas, but they will tend to stick to the tub a little bit. It’s usually a small amount that’s easy to wipe away from the tub. Nothing like the results shown here! I hope this helps Taylor! I love your honest reviews of the products you make (and test)! Usually people will only post their successes and gloss over any negative points. Thanks for the heads up on using activated charcoal and liquid black iron oxide in bath bombs! I always use regular (non gel) food color for my bath bombs. I just rub a few drops into my hands (with gloves on of course) and scrunch in quickly to prevent fizzing. So, I’ve been making some pretty dark bath bombs, because my customers are asking for black bath bombs (I have some pretty rad customers). So far I’ve made a bomb that turns the water a very deep purple, and I made it by mixing powdered lake colours (red and blue) at their max usage rates. I’ve had no issues with colour sticking to skin or bathtubs, but I’m still unable to achieve that striking black water. I can’t use black Wilton colourant because I need to sell my bombs, but I did buy some to try out for myself. Next I’m going to try using some other combinations of colourants, and I’ll give the polysorbate 80 a shot. Tanissa, the color tends to stick to any scum or residue on the tub. Before using a brightly-colored bath bomb, I like to scrub my tub with a mixture of baking soda and water. I find that gets rid of any residue! However, with really brightly-colored bath bombs we found the color sticks even with a squeaky clean tub. I would recommend keeping a rag nearby to wipe of any transfer! That post is about lip balm, but it applies to bath bombs as well! Thanks everyone for the information. Can anyone share how much polysorbate 80 to use? Looking to change my bath fizzy recipe. Poly 80 is your friend with making black bombs. I’ve been able to make mine with the use of mixing lake colors. Still adding poly 80 & haven’t had anything bananas happen in my tub other than black water. How much poly 80 are you using? I need to crack this recipe! I like the idea of it as a seasonal item. I think a good test should include extra clinging stopping agents. 10% of the batch with SLS for extra cleaning, 1/4 of the Baking soda side as Cream of TarTar for added protection, Polysorbate 80 to disperse the bomb, and maybe to add depth to the bomb make the bath bomb with like a midas touch clone but roll the oxide bath bomb in activated charcoal or use a powder shifter to lightly apply it over the bath bomb and adhere with a 99% alcohol spray to keep the charcoal on it. I would try it out but I have 400 more bath bombs to make first for a opening sale. If any one does let me know how it turns out! Thanks for doing this! The mess is exactly the reason I did not want to try this myself, and I really liked the honesty about the whole process in the blog post. Glad you enjoyed this post Margaret! We had fun testing them, even though it did require a lot of clean up :). I’m happy you found it helpful! I love bath bombs, and i was excited to read about the black bath bombs you wrote about ,and even more i appreciate your honesty. I think i’ll pass on making them black. doesnt seem worth the trouble. i found a great recipe at http://simplelifemom.com/2014/01/03/anti-aging-with-essential-oils/. between them and your blog you really cant go wrong. thanks so much. So glad you found this post helpful Millie! They are fun for the novelty aspect, but I don’t think I’ll be making my black bath bombs black either :). Those recipes look great. We stay away from claiming our projects are “anti-aging,” because many of our readers sell the projects they make, and making medical claims means your product is considered a drug by the FDA. You can read more about that in the post below if you’re interested :). You need polysorbate 80. It helps the non-water soluble colors disperse in the tub better and not stick to the skin or sides of the tub. That’s how people are doing it. With a combo of water soluble colors, lots of black mica and black oxide, and polysorbate 80. I use it in all my bath bombs regardless of the type of colorant I used, because it helps to emulsify the oils into the water. That way, I don’t have an oil slick sitting on top of the water from my bombs. I myself know nothing of the black bath bomb trend, I have to say it doesn’t appeal to me. I wonder if clays would work; if it would color deep enough and not harden to turn the bomb into a literal bomb. I do use the Wilton icing colors from time to time, particularly in bath bombs because they are glycerin based colors and work so well and dont’ stain the tub. I don’t specifically know if they are considered skin safe, but they are certainly edible and food safe. I know this is off your subject of bath bombs, but it fits with Michael’s comment about Wilton’s icing colors. OK, I’m over 6’3″ tall and don’t fit well into a tub for a bath so I always shower. I prefer a shower, anyway!! I won’t be making bath bombs any time soon unless my wife wants one. Regarding the Wilton’s icing being skin safe, I use it in my soap. All the colors work well in hot process soap and the yellow and pink work well in cold process soap and a VERY little bit goes a VERY long way. Both hot process and cold process soaps with Wilton’s icing coloring are always awesome looking and work great with no issues. I hope this helps, Michael! Please remember that these icing colors are not approved for use in saleable items for those people that might be considering trying it. Hi Michael, Amy and Eric!